The introduction of Collodion in 1851 by FSA was major advance in photography, which was greeted with considerable enthusiasm by both amateur and professional photographer alike. 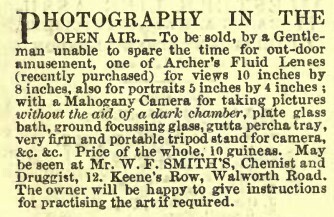 It was free from any patent issues following the verdict of the Laroche v Fox Talbot Trial of December 1854; and could be used without fear of court action. It was also capable of producing highly detailed photographs which could be readily copied, thus being a marked improvement over the Daguerrotype and Calotype processes. Collodion was a viscous liquid, made from guncotton, i.e. carded cotton first dissolved in Nitric Acid, then further dissolved in a mixture of ether and alcohol. Gun cotton which had only been invented in 1846, but which quickly found a use during the Crimean war; when it dried it formed a very thin clear film, which was ideal for dressing and protecting wounds. Collodion had its disadvantages however. Primarily there was the fact that a wet plate had to be used within about twenty minutes of preparing and secondly because of its slow photographic speed. The preparation of wet plates required numerous chemicals, beakers and liquids, all mixed in the dark in a portable tent if the photographer was planning on photographing away from the studio. 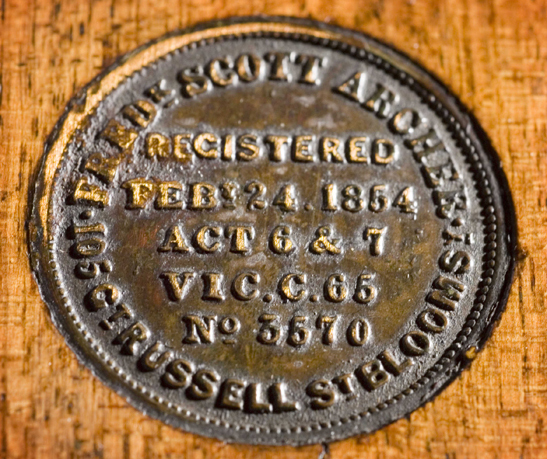 However, Frederick Scott Archer developed a special camera which when mounted on a tripod, served also as complete darkroom. The origin of the Kew Photoheliograph as it became later known, lies in a letter written by Sir John Herschel to Colonel Edward Sabine, Secretary of the Royal Society, dated the 24th April 1854, in which he said: " I consider it an object of very considerable importance to secure at some observatory, and indeed at more than one, in different localities, daily photographic representations of the sun, with a view to keep up a consecutive and perfectly faithful record of the history of the spots. So far as regards the general delineation of the whole disk, and the marking out on it, in reference to the parallel to the equinoctial passing through its centre, the places, sizes, and forms of the spots, there would need, I should imagine, no very powerful telescope,—quite the contrary; but it should be equatorially mounted, and ought to have a clock motion in the parallel…” As a result of Herschel’s plea, the Royal Society of London allocated a grant to the committee of the Kew Observatory to that end. The astronomer, Warren de La Rue took up the challenge and produced a design for his 'photoheliograph'. Andrew Ross of London, the famous optical instrument maker was given the commission for its construction. 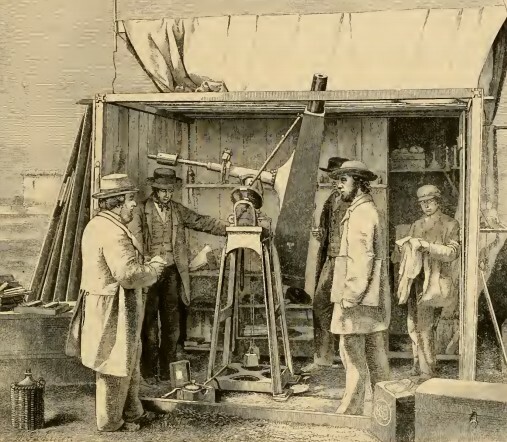 The Photoheliograph De La Rue and Ross created was the first of its kind – a photographic telescope or Astrograph specifically designed and constructed to take images of the Sun. In essence it consisted of a small refracting telescope enclosed in a wooden case at the end of which was fitted a photographic collodion plate holder. The completed design was further described by De La Rue in the following words: “The object-glass of the photoheliograph, it will be remembered, is of inches clear aperture and 50 inches focal length, but the whole aperture is never used; it is always diminished more or less; and generally to about 2 inches, by a stop placed in front of the object-glass. The focal image of the sun at the mean distance is 0.466 inch. The focal image is not, however, received directly on the sensitive plate, as in the case of taking lunar and planetary photographs, but is enlarged before it reaches it by means of a secondary combination of lenses (an ordinary Huyghenian eyepiece), which increases the picture to about 4 inches in diameter, thus magnifying the image about eight times linear, and diminishing the intensity of the light 64 times.” The instrument had to overcome a number of design issues, and in particular those relating to reducing the exposure times in order to 'dim' the brightness of the Sun which produced over exposed plates. The photoheliograph was completed in 1857, and transferred to the Kew Observatory, where it took its first picture of the Sun in March 1858. In 1860 it was transported to Rivabellosa, Spain complete with its own portable collodion darkroom to take photographs of the Total Eclipse of the Sun, which took place on the 18th of July that year. Its use helped astronomers begin to understand the physical processes which take place in Stars. Archer's Collodion Process was the key to its success. While Archer gained very little commercial success as a photographer he maintained his living working precariously as an inventor. 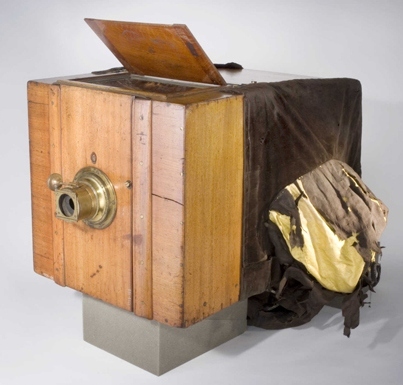 His inventions included a camera inside which the various developing processes for the Calotype could be self-contained (later adapted for Archer's own collodion process by his friend William Morgan Brown of Ewell, Surrey) and a variety of types of lenses. He regularly advertised his cameras and lenses in Journals such as Notes & Queries.